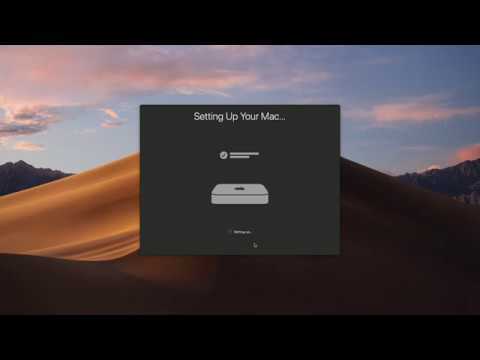 In this video, we show the upgrade done to our Mac Mini Late 2012. The update from High Sierra to macOS Mojave took 37 minutes and 3 reboots. What's new in the macOS Mojave? At the Appearance section, choose between Light and Dark Themes. At the Account Color choose which accent you want for your buttons. Open Desktop & Screen Saver. Select one of the Dynamic Desktop wallpapers which will change according to the time of day. Under the Mojave context menu, also select the Dynamic setting. If you scroll further down, you will see some new static wallpapers as well. Worth having a look. On Desktop, open the View menu. Click Use Stacks. This will organize your Desktop Icons according to their file type. Navigate to the Group Stacks by submenu to select different types of Stacks (by Date etc). Open the Dock preferences pane. Enable the Show recent applications in Dock. On Spotlight, type Screenshots and press Enter. Here there are options to capture a snapshot of part of your screen or full screen, and you can also screen record (as a video) again the full screen or part of your screen. Other options include wait 5 or 10 seconds before taking the screenshot, and include the mouse clicks during recording. Quick Look now includes Markup tools to help you edit your screenshots or any other image. You can also now trim your videos through QuickLook and share them. Navigate to the Tabs tab. Enable Show website icons in tabs. Import a scanned document from your iPhone. From the apps (such as when creating a new email message in Mail app) or from the Desktop and right-click context menu, click on Import from iPhone. You have the option to Take Photo, or Scan Documents. This will automatically open the Camera app on your iPhone so you can take the photo. After you take the photo, it will automatically show on the open app, or your Desktop in macOS. Again you can edit the photo with new Markup Tools. Open the Siri preference pane. Select Enable Ask Siri to be able to talk to Siri. On Voice Feedback, you can set it to Off to disable her voice. Open the Accessibility preferences pane. From the list on the left, click on Siri. From the right, select Enable Type to Siri.